Obliterated. Her family was obliterated. Little Mayar, a noisy rascal of a girl, runs back and forth through the guest room, harassing the goats, sometimes aggressively demanding affection and attention from her grandparents Makhrous and Dalal, sometimes being a cutie and posing for the camera. She understands only to some degree what happened in 2014. 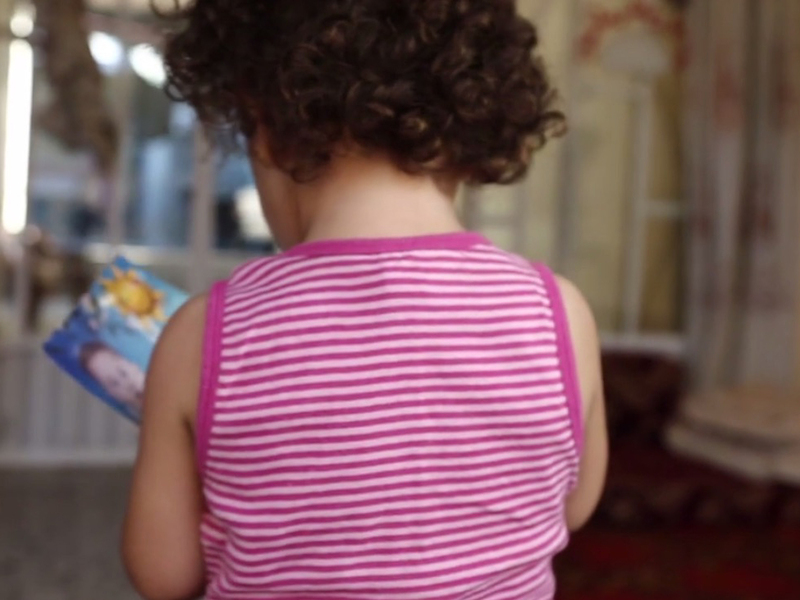 She lost her parents, and her only sibling, 5-year-old Moin. 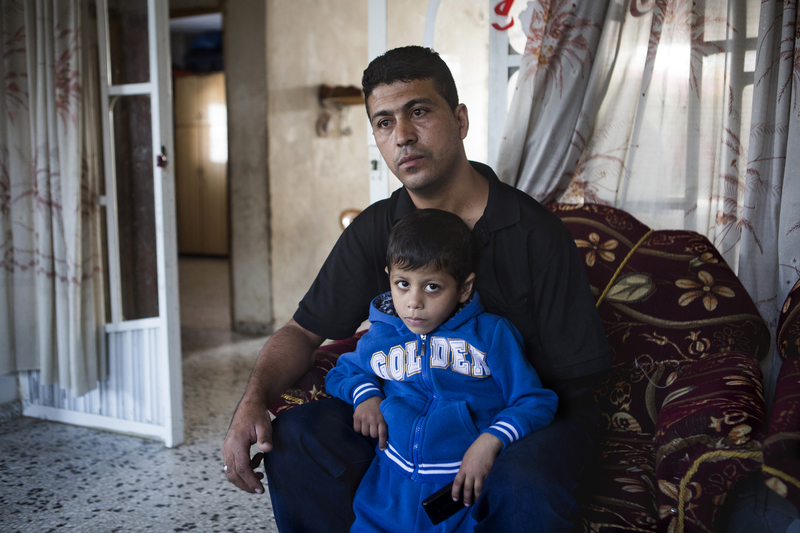 Nabil and his son Baderaddin, standing in the place where the Siyam family was attacked. 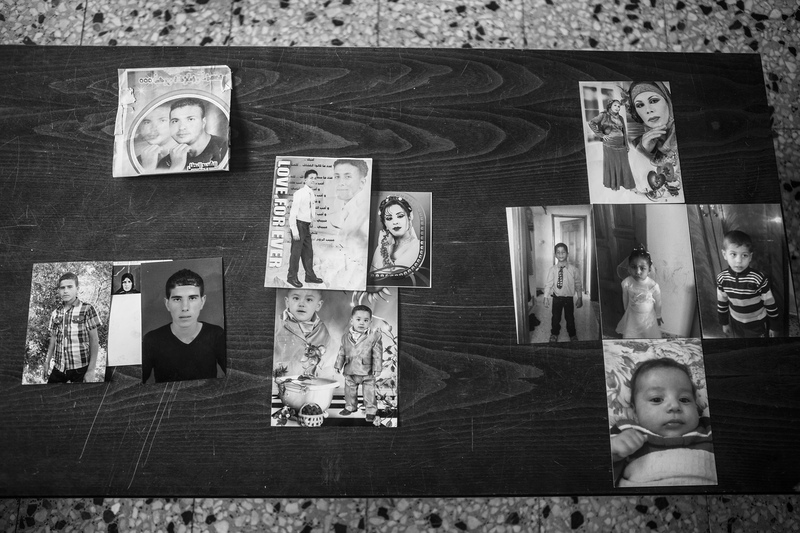 Nabil’s immediate family was obliterated too, but unlike his niece Mayar, the 36-year-old is acutely aware of the loss. 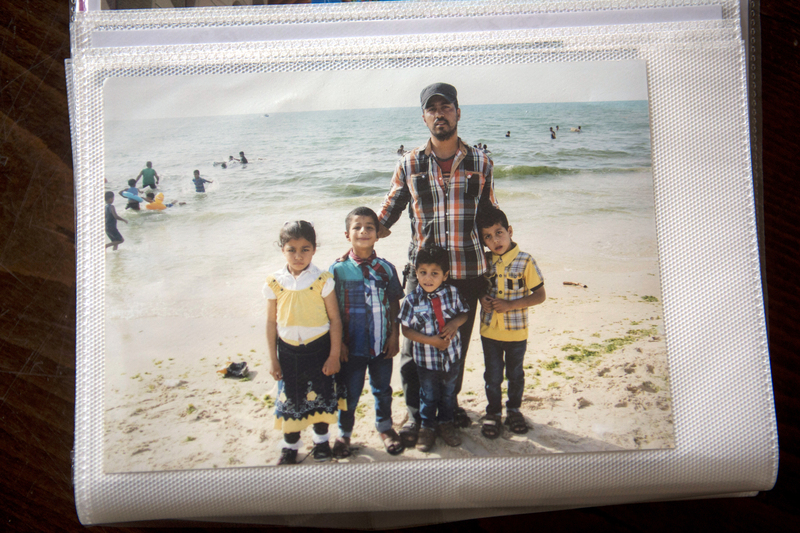 He lost his wife Shirin and four little children: Gheidaa’, Mustafa, Abdel Rahman, and Dalal. 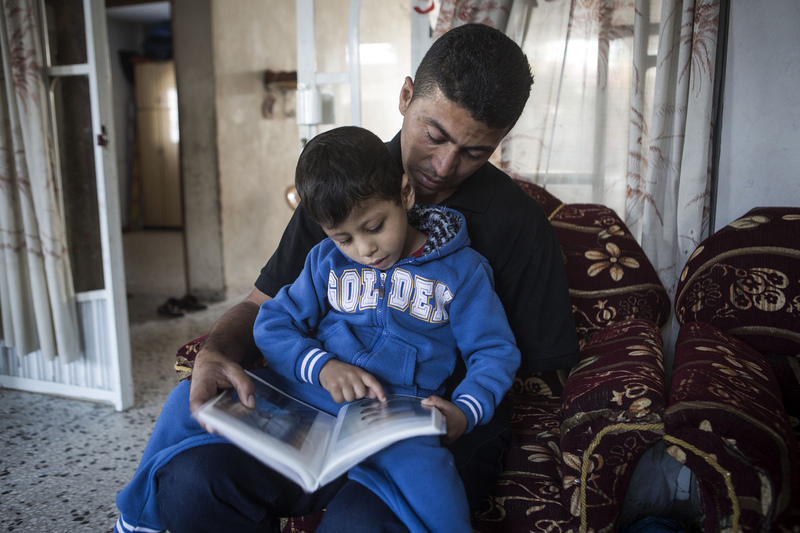 Nabil and his now 7-year-old son Baderaddin are the only survivors. 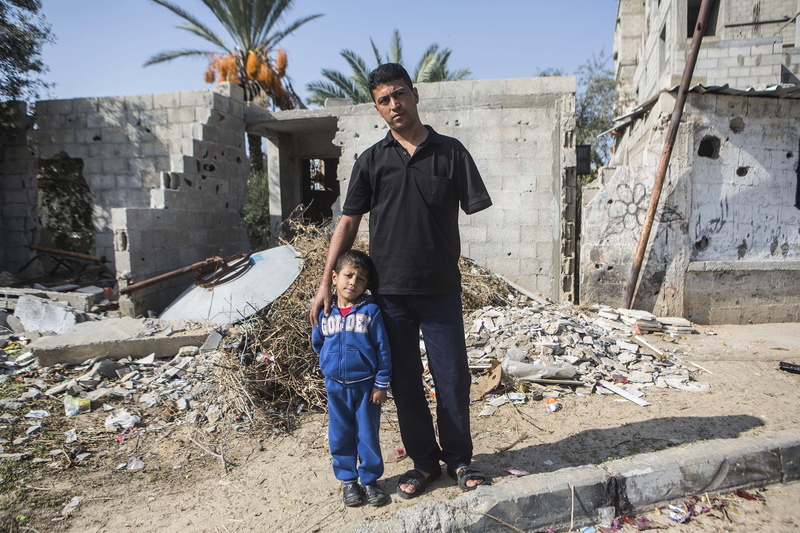 Both were seriously injured, and Nabil’s left arm was torn off in the explosion. 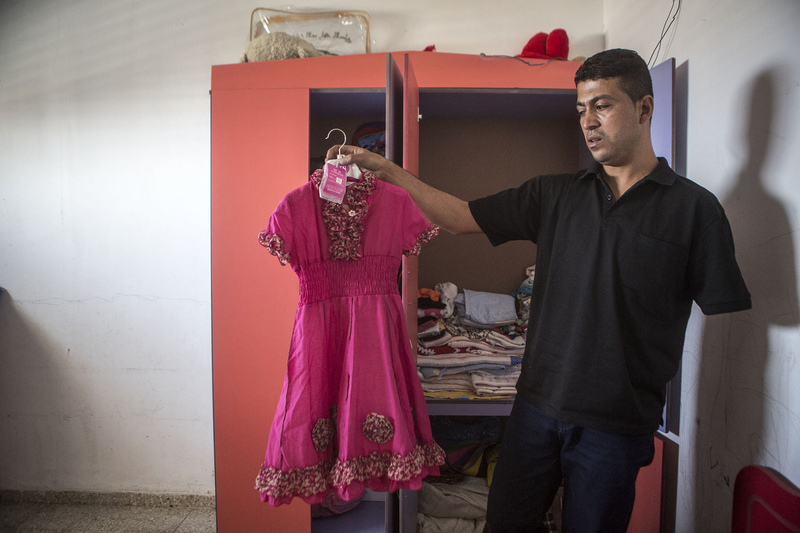 Siyam's house is filled with memories of those killed; the photo albums, the kids' bedroom, the dress Nabil got for Gheidaa' for Eid, which she never had a chance to wear. It is the third day of Eid al-Adha, and Makhrous – Nabil’s father and Mayar’s grandfather – wishes us a happy Eid with tears in his eyes. For the Siyams this is a difficult day to be joyous. The holiday tradition is to visit your family or receive visitors such as your siblings and their families, your children and their grandchildren. A little bit more than a year earlier, in summer 2014, the house of Dalal and Makhrous was hit with shrapnel from a shell. Most of their grown-up sons and daughters were present in the house with their own kids, visiting on the occasion of Ramadan: 30 people all together. When the artillery fire neared their house, they all fled into the street. “As we ran for our lives, two missiles hit us, right in front of the gate to our house,” says Dalal. “When the shrapnel hit the house, we had to run for our lives”, says Dalal. On the third day of Eid, the Siyams’ house is rather empty. We talk to the grandparents, while Mayar and her playmate, Moataz, run around. The little boy’s father Ayman, who also lost his wife in 2014, will stop by to give us buckets of flowers. “For Eid,” he explains and sits quietly in the corner, while Makhrous and Dalal recount all the times the family had to flee in the past half-century. In Arabic a feast, festival, or holiday. The two Eid are the most sacred days in Islam: Eid Al-Adha is the holier of the two and commemorates the alliance between Ibrahim and Allah through sacrifice. Traditionally a sheep or goat is sacrificed during the celebrations. Eid el-Fitr marks the end of the holy month of Ramadan and the start of a feast lasting several days. 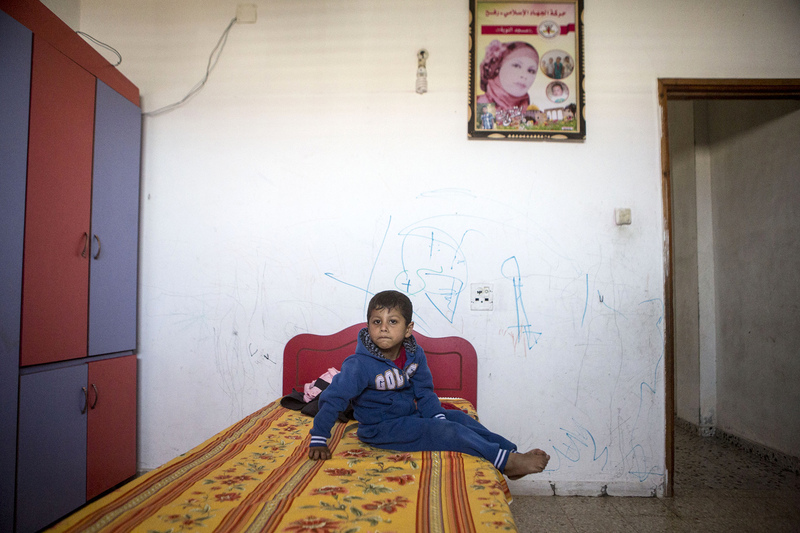 Makhrous now lives in Rafah, in the Gaza Strip, where today there is an entire generation of kids that had experienced three wars by the time they finished kindergarten. He is as old as the occupation: a Nakba baby, one might say. His wife Dalal is the same age. They lived through the 1948 ethnic cleansing, though the memories they have of that are only those passed on by their parents, and through the 1956 invasion followed by the first short-lived Israeli occupation of the Gaza Strip, and then through the war of 1967, which they can recall with gruesome details. In Arabic chosen. 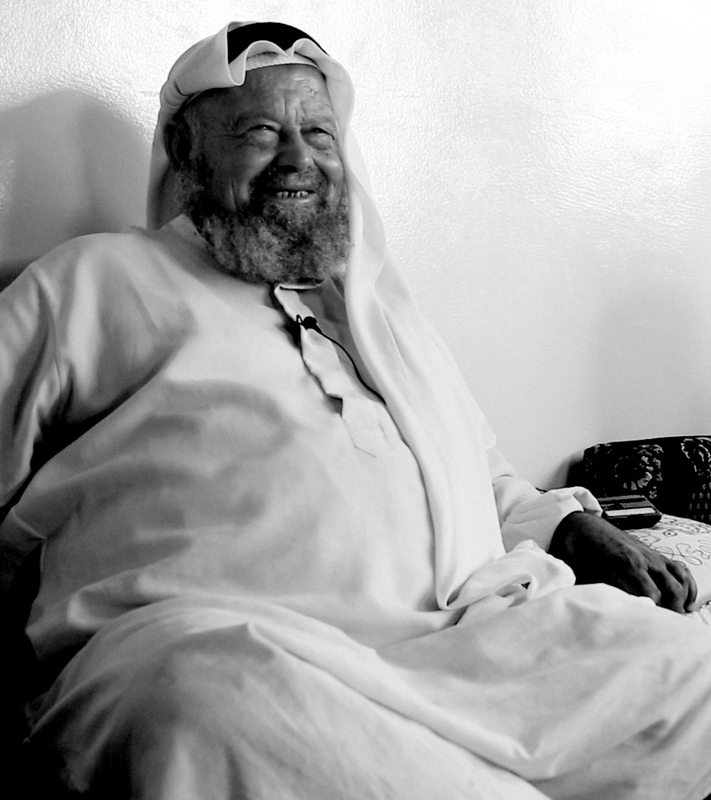 A leader of an Arab village or district within a town, or a number of extended families. Usually chosen or approved by consensus. The muhktar is responsible for managing the village or the neighbourhood, including mediating conflicts between inhabitants, maintaining peace and security, etc. In Arabic catastrophe or disaster. It refers to the expulsion of approximately 700,000 Palestinians from their homeland by the Jewish militia before and during the 1948 war, which led to the establishment of the state of Israel. 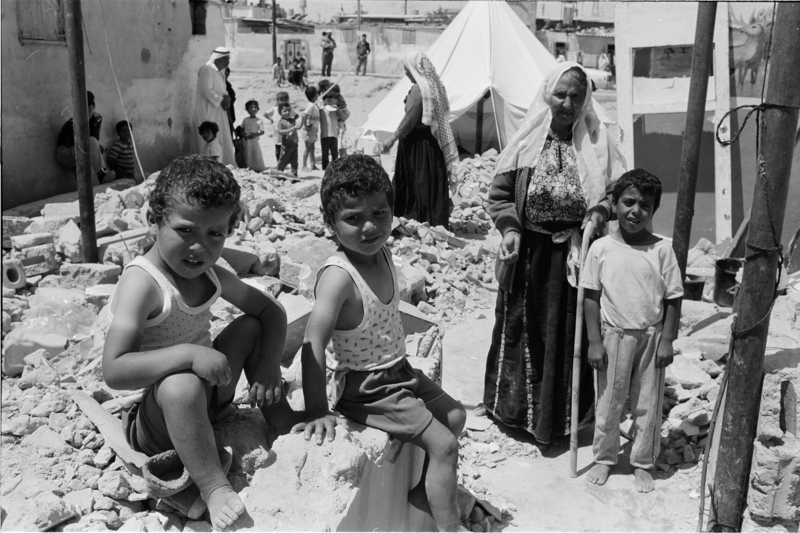 Palestinian refugees were never allowed to return, and hundreds of their villages were destroyed. “It’s hard to remember. Martyrs, martyrs, martyrs, too many in my life; so many, they made me forget how many years have passed,” adds Dalal. In Arabic shahid. In the context of the Palestinian struggle, it is common to speak of martyrs, regardless of the faith or religiosity of a person, when someone’s death has been caused by the Israeli occupation. In general, a martyr is someone prepared to die for their faith or beliefs, though the term shahid in Islam includes different circumstances, for example, people who died in natural disasters or women during childbirth. Palestine came under British mandate following World War I, after being a province of the Ottoman empire for 400 years. The mandate fixed clear borders to Palestine and formally charged the British administration with two contradictory tasks: one was to provide for the indigenous population and the second to establish a Jewish homeland on this territory. “How did my parents meet? My father was already married, and had grown-up sons. One of them wanted to get married. So, my father went to this one family to ask them if his son could marry their daughter. But when he saw that woman, he immediately liked her and asked for her to become his second wife. That was my mother. And my half-brother ended up marrying her sister.” – Makhrous explains. 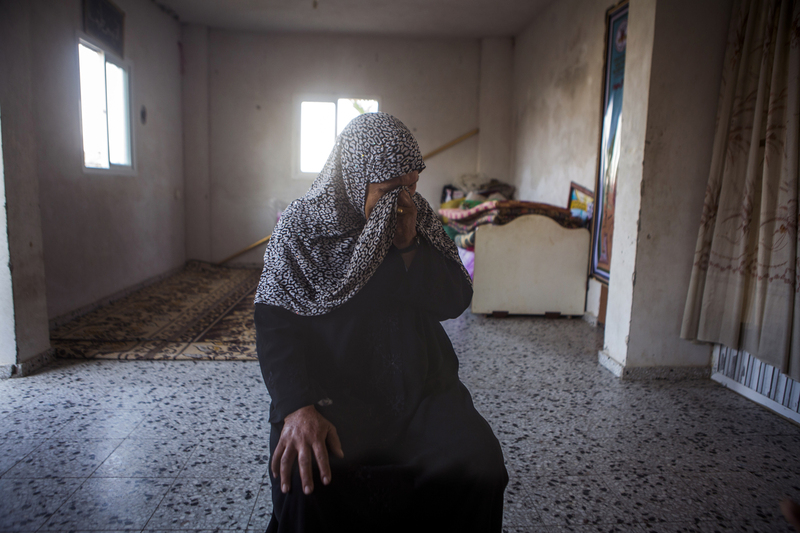 Why did the parents of Makhrous felt they should leave Rafah? Why did the forests of Palestine nearly disappear? During the Mandate, Palestine depended on imports of wood from Europe and Asia. During World War II, the imports ceased and the demand for wood grew: “A situation worsened by increased food demands and high prices, which led to more clearings and cultivation. The British Army, stationed in the country, was the biggest timber consumer, particularly the Royal Engineers; followed by match, then plywood, factories”, explains Roza I. M. El-Eini in Mandated Landscape: British Imperial Rule in Palestine 1929 – 1948. A special administrative body was set up in the early 1940s to protect the forests: a Utilization Section, which “ominously estimated that Palestine’s forests would be depleted within 18 months”, adds the author. On 13 December 1947, Irgun, a Jewish militia, attacked al-Abbasiyye, alongside other villages in the area. 24 men disguised in British army uniforms infiltrated the village, setting bombs in houses and throwing grenades at others, while part of the group opened fire on villagers who were sitting at a cafe. They left behind them a car which exploded in the village. At least 14 people were reported killed in this attack. What happened in al-Abbasiyye and with its inhabitants in the following months? The village was attacked again in February 1948. At the end of April, Hagana (the Jewish militia and the precursor of the Israeli army) took control of the area. On 3 May 1948, in the middle of the night, another Jewish armed group, the extremist Irgun, attacked and occupied the village, forcing away its population of approximately 6500 people. Later that year the town was partially destroyed, leaving as the only reminder of what was once Al-Abbassiyya/Yahudiya a mosque, a shrine and a few houses which make up what is now known as ‘old Yehud’, the Jewish name given to the Israeli settlement built on the rubble. 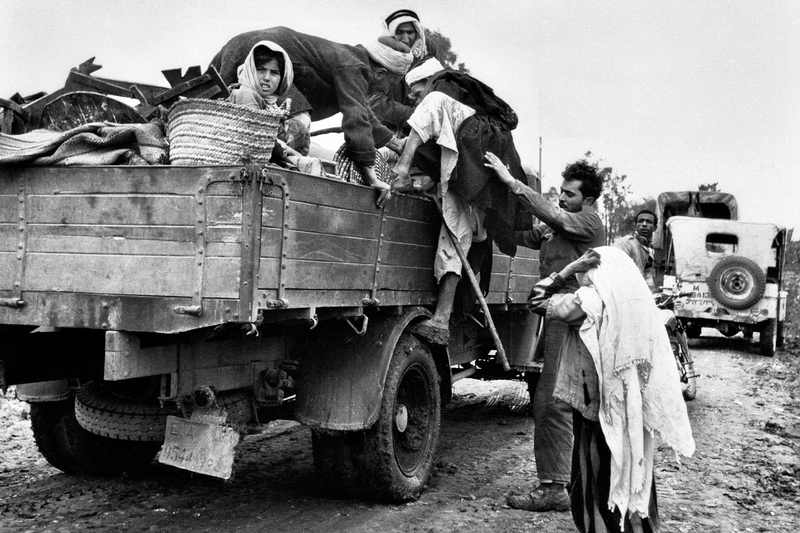 Expulsion of the Palestinian villagers from al-Faluja, 30 km northeast of Gaza city, 1949. 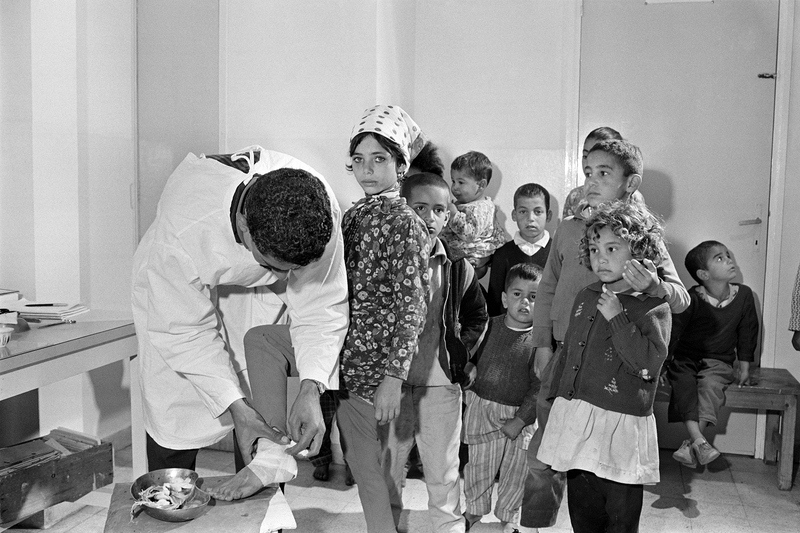 Photo source: UNRWA archives. This was the beginning of the ethnic cleansing of Palestine. The expulsion peaked in spring and summer of 1948, and still goes on in different forms to this day. Makhrous and his family were a part of an estimated 700,000 Palestinians who were displaced by the nascent Israeli forces, and forbidden from ever coming back to their homes. When Makhrous’ parents and their family were waiting in Rafah to return back to al-Abbasiyye, around 4,000 Jewish immigrants settled in their former village. 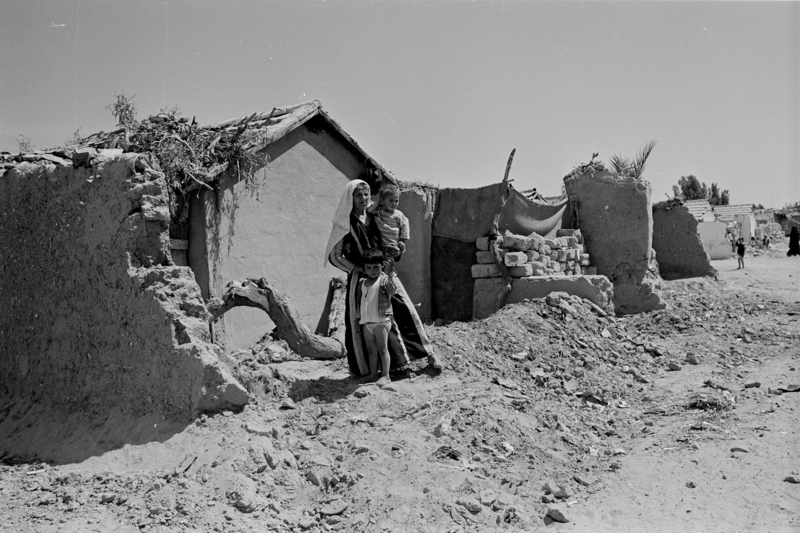 Dozens of ethnically cleansed villages were to be homes for the newly arrived Jews from Europe and the Middle East; their presence was a guarantee against any of the original inhabitants ever returning and an argument to support Israel’s territorial claims in future negotiations. “The conditions were difficult, houses were very close to each other,” says Makhrous. 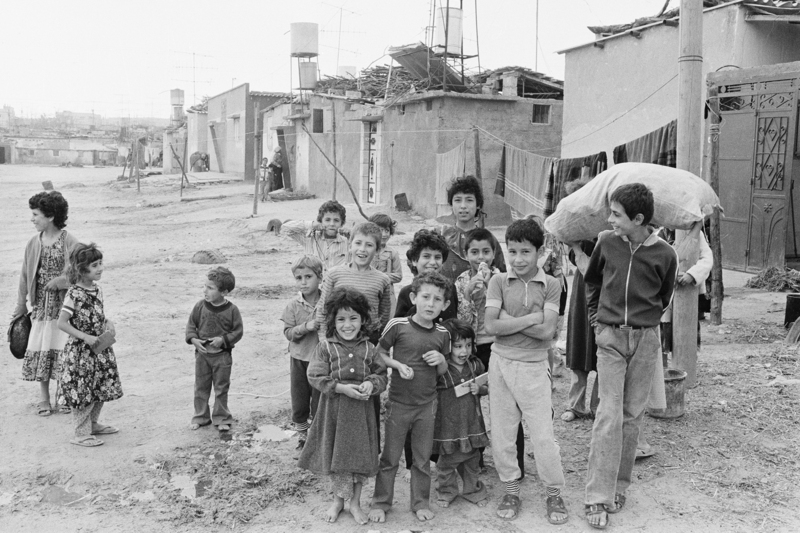 Life in the Rafah refugee camp in the ‘60s, ‘70s and ‘80s. 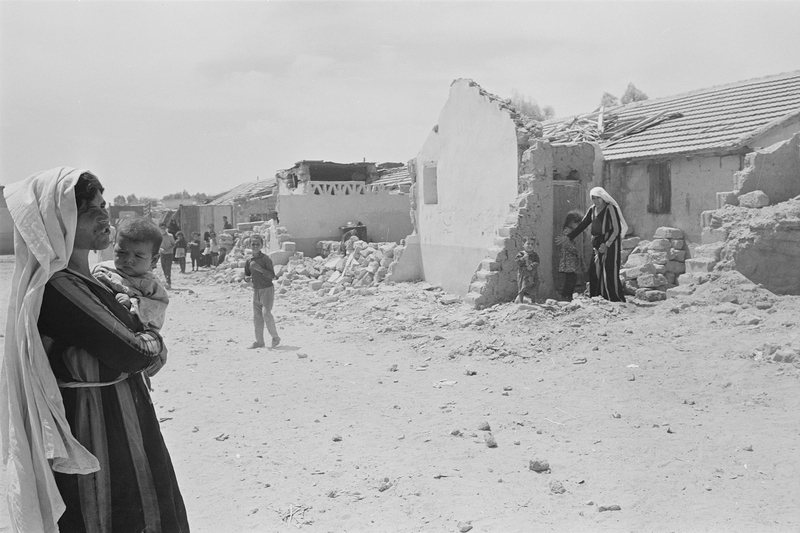 Photo source: UNRWA archives. 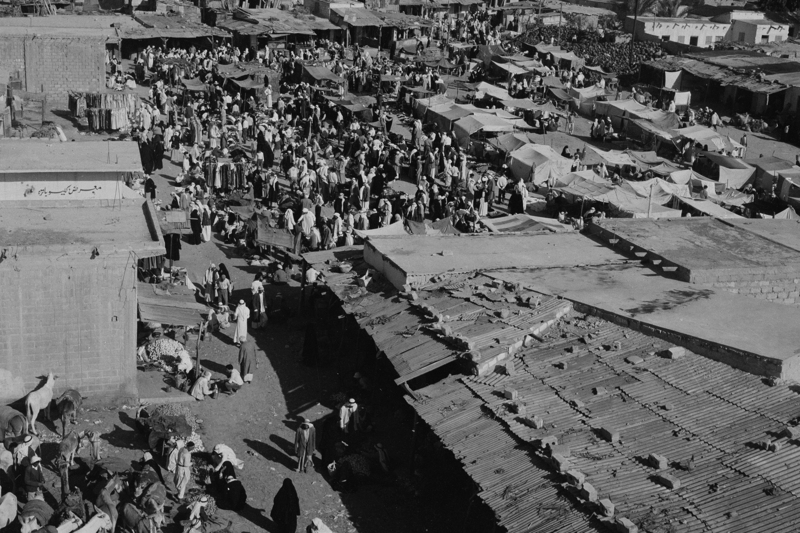 While the Jewish immigrants who moved into Palestinian houses often tried to settle down as fast as possible, with much encouragement from the state, Palestinians didn’t want to take root in the refugee camps. For years, there was no attempt at providing more permanent infrastructure, because many had expected their return would be a matter of weeks. Remains of al-Abbasiyye village, in Yehud; the Jewish town has been built on top of the destroyed Palestinian village, 2010. Photo courtesy of Deborah Bright. Makhrous: “Mayar, habibti, go to your father…. eee… uncle, yallah. There’s too much noise. So let’s continue with the story… We had just taken our last high school exam when the Six Day war broke out. We were asked to volunteer and stationed close to the farm lands. Suddenly, almost above our heads, a fleet of airplanes flew; they came from the north and were headed towards Egypt. Soon after, the tanks came. People were confused: the Israeli tanks arrived with Iraqi flags. Our neighbour went to greet them. He was shot dead. We didn’t know how to evacuate the dead and injured. We put one man on a donkey and hoped to find a doctor. Why did the Israeli tanks have Iraqi flags? There are a few recorded eyewitness accounts of Israeli tanks bearing either Egyptian or Iraqi flags during the 1967 war, both in the Gaza Strip and in the West Bank. It was not the only time in its history that Israeli forces have been seen masquerading as their enemies. Quite the contrary in fact. Since the general strike in 1936, it has been a common tactic, and was often deployed during the Intifadas [source: Kameel B. Nasser’s Arab and Israeli Terrorism: The Causes and Effects of Political Violence, Chapter 3: Israel’s Use of Arab Disguises]. In 1969, Israel conducted an entire military action, codenamed Operation Raviv, based on their disguise as Egyptians. In the recent years Israeli police have often used the ‘mistaravim’, undercover agents pretending to be Palestinian protesters, their role often being to turn the demonstrations more violent. Photos from the early years of the Israeli occupation of the Gaza Strip, taken after the 1967 war. “The extremely violent Israeli offensive, with shelling and house-to-house fighting, caused substantial damage. 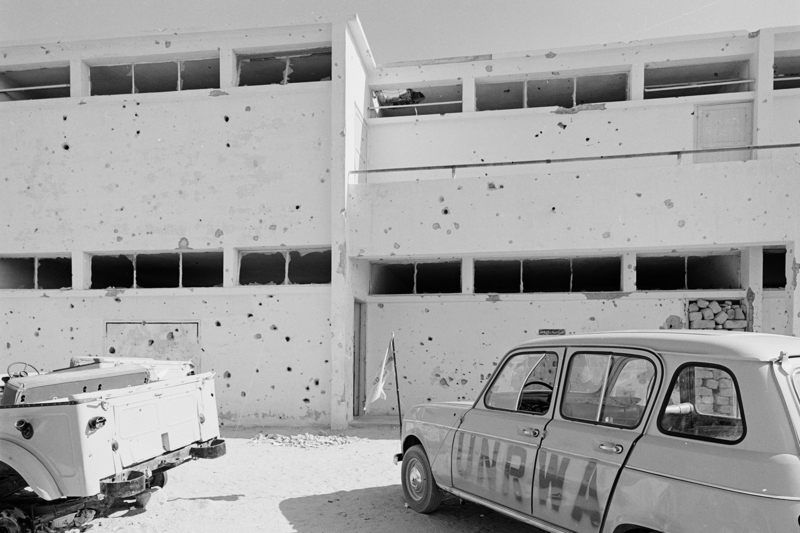 UNRWA estimated that 90 out of its 100 schools were damaged in the fighting, hit by shellfire or both”, Jean-Pierre Filiu writes about the Six Day War in Gaza: A History. 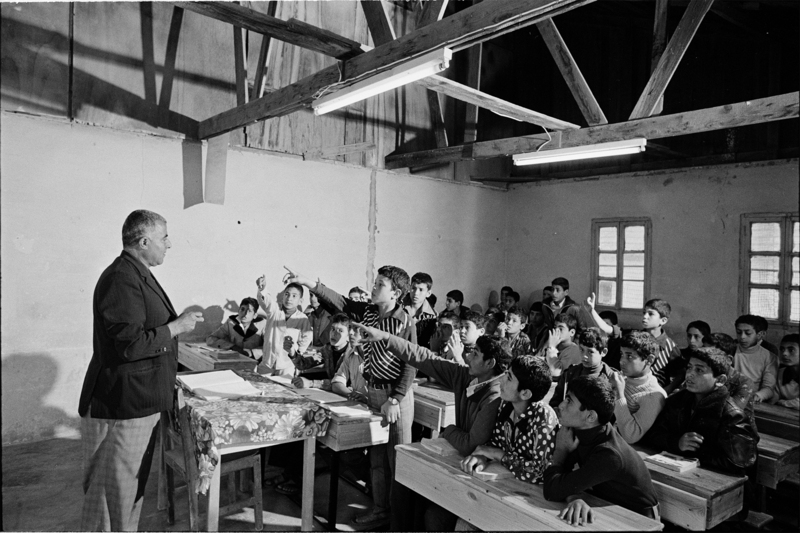 Photo source: UNRWA archives. The Six Day War ended with Israel taking over huge swaths of territory. It imposed military occupation on the Sinai Peninsula, the Gaza Strip and the West Bank, East Jerusalem and the Golan Heights, later annexing the latter two. On 8 July 2014, Israel begins its offensive against the Gaza Strip. Two weeks later, in the early morning hours, the Siyam family escapes their house as the shells are falling nearer and nearer. Just as they exit the house and start running for their lives, they are targeted from the air. Two children, three-year-old Mayar and even smaller Moataz, make a lot of noise; they play with the glass door separating the living room from the roofed patio of the Siyam family house. The adults are unusually patient with them. The kids do not get scolded and when they call out for someone’s attention, they get it immediately. Mayar’s playmate, noisily crying, is Moataz, her year-and-a-half-old cousin. He was just five months old when his mother was killed in the attack. Mayar abruptly runs into the room and calls her grandmother, Dalal, ‘mama’. “What is it, my dear?” Dalal responds attentively. “Mayar doesn’t understand what happened”, explains Dalal. But it seems that Mayar understands at least some of it. She used to cry a lot; cry and scream. She used to call out for ‘mama and baba’ (mom and dad), but her parents could not come to console her. 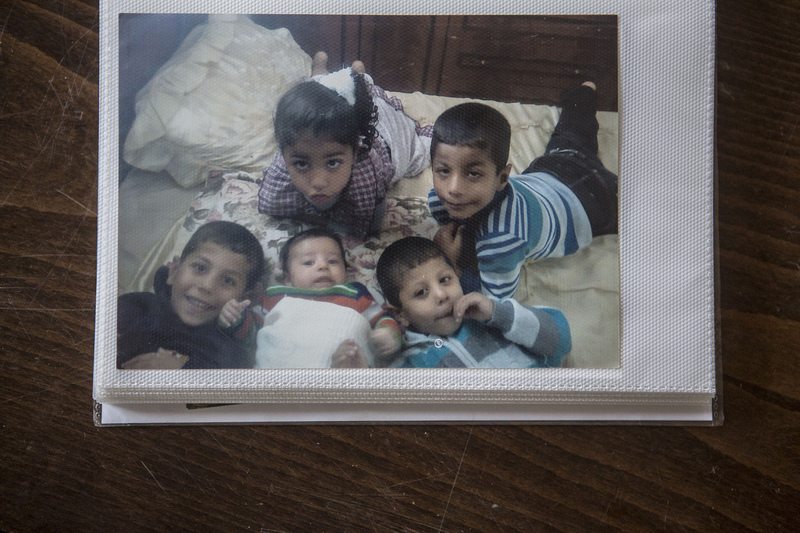 Sometimes, running around the house, Mayar notices their pictures, hanging high on the wall, along with other members of the family who were killed. She stops in front of them, stares and starts making noises, mumbling to herself, her voice growing, until someone comes and picks her up, lifts her to the pictures, so she can give a kiss to her parents. It’s late, the muezzin is calling for prayer, and Makhrous wants to go to the mosque. He feeds the goats and calls a cab for us. We wait, talking about the growing prices of meat, fuel, clothes, and all the family problems he has to mediate as a mukhtar. It’s dark outside and electricity for Rafah area has been cut. This is how it is in Gaza: electricity is on for six to eight hours and off for the following six to eight hours. We hear honking outside – the taxi driver is letting us know he has just arrived. We say goodbye to Makhrous and Dalal. As we get into the car, I recognize the driver and his voice from Anne Paq’s photos and videos. She met his family almost a year earlier. It’s Nabil. I visited the Siyams’ house three times and never met him there. “It’s too difficult to sit at home,” he tells us, smoking a cigarette and driving, all with his one remaining hand, on the way to Gaza city. 5, MOHAMMED'S SON. HE DIED THE NEXT DAY AFTER ATTACK. 42, DAUGHTER-IN-LAW OF DALAL AND MAKHROUS; WIFE OF AYMAN MAKHROUS SIYAM; SHE DIED OF HER WOUNDS ON 14 AUGUST 2014. 15, DALAL AND MAKHROUS'S GRANDCHILD; HE DIED ON 18 NOVEMBER 2014 FROM HIS WOUNDS, IN TURKEY.